This Quick Start deploys a highly available architecture for cloud video editing on the Amazon Web Services (AWS) Cloud. The deployment uses Amazon Simple Storage Service (Amazon S3), Amazon Elastic Compute Cloud (Amazon EC2), Amazon Virtual Private Cloud (Amazon VPC), AWS Directory Service, and Remote Desktop Gateway (RD Gateway) instances. This reference architecture is automated by AWS CloudFormation templates that deploy the environment on AWS in about 30 minutes. You can customize the templates to meet your specific requirements. A virtual private cloud (VPC) that is configured across two Availability Zones. For each Availability Zone, this Quick Start provisions one public subnet and one private subnet, according to AWS best practices. In the public subnets, Edit Host instances and Remote Desktop Gateway (RD Gateway) instances in an Auto Scaling group for secure access to EC2 instances in the private subnets. In the public subnets, managed network address translation (NAT) gateways to provide outbound internet connectivity for instances in the private subnets. An AWS Identity and Access Management (IAM) role to enable AWS resources created through the Quick Start to access other AWS resources when required. 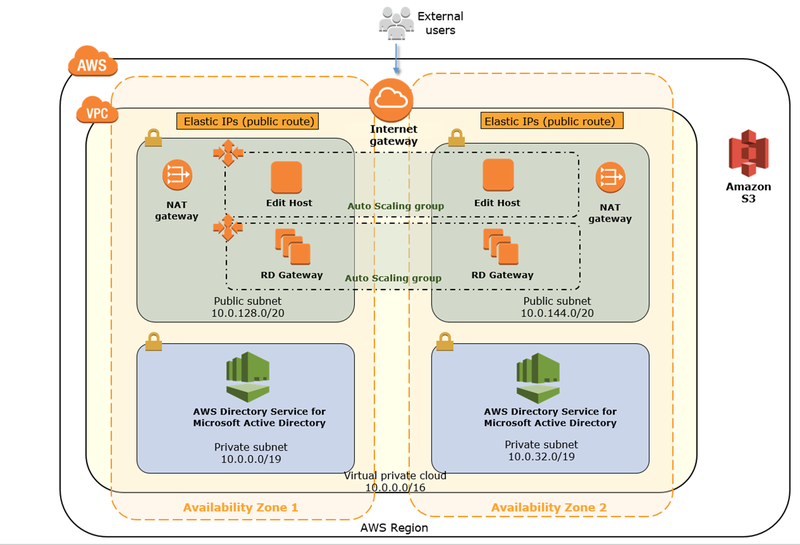 In the private subnets, AWS Directory Service for Microsoft Active Directory, which provides most of the features that Microsoft Active Directory offers, plus integration with AWS applications. An Amazon Elastic Compute Cloud (Amazon EC2) G3 instance, which offers a powerful, low-cost, pay-as-you go model for high-end workstations. Amazon Simple Storage Service (Amazon S3), which is an object store that provides artifacts necessary for the Quick Start. You can also use it to upload video for editing on the G3 instance. Obtain a Teradici Cloud Access Software License. Subscribe to the NVIDIA GPU AMI (NVIDIA GRID Driver) in AWS Marketplace. Use Teradici’s PC-over-IP (PCoIP) technology and the AWS Management Console to verify the deployment, and start using the G3 instance for your cloud video editing. The Quick Start includes parameters that you can customize to best meet your business, IT, and security requirements. This deployment launches a cloud video editing environment automatically into a configuration of your choice. Teradici provides a 60-day trial license for Cloud Access Software. For more information about pricing, see the Teradici website. You are responsible for the cost of the AWS services used while running this Quick Start reference deployment. There is no additional cost for using the Quick Start. See the pricing pages for each AWS service you will be using for cost estimates.